It can be expensive, so it is important that you know how to cook asparagus. Browse through these tips and hints before you begin. • One cooking method is to stand the asparagus in three inches of boiling water, cover and cook for 8 minutes or until the tips are tender. This method cooks the thicker bottom stalk while steaming the more tender tips. Steaming should be reserved for only the youngest, most tender asparagus. • To blanch, fill a large pot half full of water, add one tablespoon salt, and bring to a boil. Add asparagus and partially cover until a second boil quickly begins, then uncover and cook for 5-8 minutes. Remove to a towel to dry. • To freeze, blanch by plunging into boiling water for 3 to 4 minutes and remove immediately to the chilled water. Drain. Pack in containers, label and freeze for up to nine months. • It is a good idea to tie the asparagus in bundles of 10 to 12 stalks for cooking, so they can be quickly removed from the water all at once. • Asparagus should be served warm or at room temperature as refrigeration dulls the flavor. • It is imperative not to overcook asparagus. • Remember, asparagus will continue to cook a bit, even after removed from boiling water. Asparagus readily adapts to other quick cooking methods, such as stir-fry and sauté. 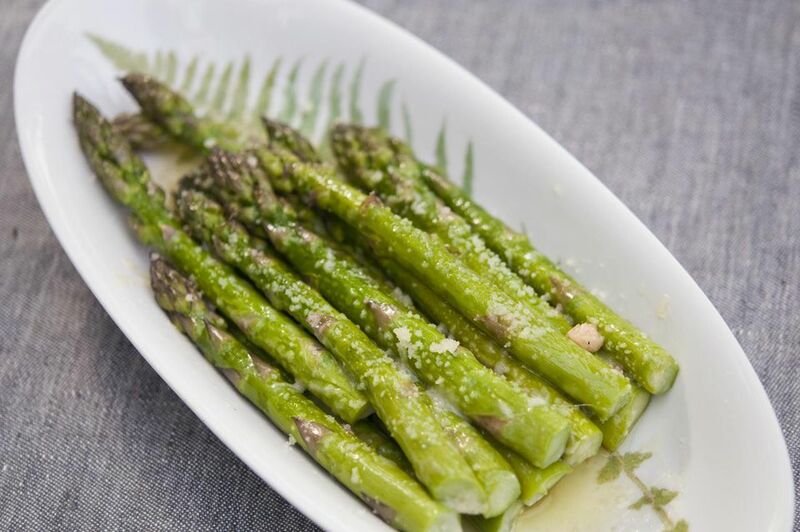 • A half pound of asparagus per person will satisfy most as a first course or accompaniment. There are 15 to 20 medium-size stalks in a pound. One pound of asparagus, trimmed and cut into 1- to 2-inch lengths, will measure about three cups.